When Morgan Freeman and Jack Nicholson died, they only had two wishes: make a movie about it with Rob Reiner, and go to a museum specializing in toilets. Sadly for them, the Plumbing Museum wasn't in Watertown in 2007. Because the world was calling out for it, TPM has answered with a well-curated travel-thru-time homage to the profession that kicked off a million poop jokes, which traces the "fascinating evolution of plumbing technologies" through the centuries, all located in an historic former Civil War-era W'town ice house chock full of artifacts like claw-foot tubs, ornate sinks, old plumbing slogans (sample: "the plumber protects the health of the nation"), antique commodes, and water closets, which would probably be a much more hygenic place for R. Kelly to be trapped. 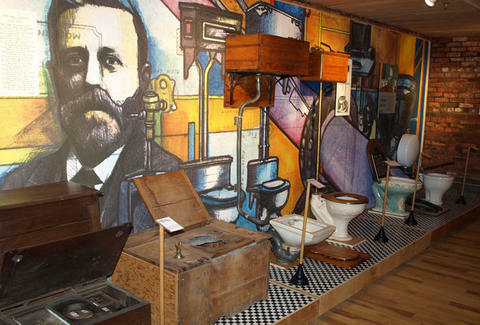 Exhibits include a giant wall cutaway of the inner plumbing found in a typical American home, a replica 1910 plumber's machine shop (with live hands-on demonstrations! ), and even a replica of Marcel Duchamp's famous 1917 signed urinal, Fountain, not to be confused with Fountainhead, which is what got Ayn Rand kicked out of the museum in the first place. There're also other highlights like a handblown glass lavatory, 1928 Kohler electric sink (the precursor to the modern dishwasher), and even a rare woman's urinal, made exclusively for Paula Poundstone. Still not convinced to have your wedding here? Well, you can even buy souvenir merch (t-shirts, mugs) at the gift shop and/or rent the entire space (which maintains a full chef's kitchen) for your next big event, which does cost a little extra, but hey, sometimes you kick the bucket, and sometimes the bucket kicks you.